Shri Thethakudi Hanhara Vinayakram (famously known as Vikku Vinayakram) is a world renowned Indian percussionist who is credited with popularizing the ghatam. It is his single-hannded effort that led to the ghatam, an instrument which was seldom given importance in Indian percussion, being now featured in world music. Shri Vinayakram was born 11 August, 1942 in Thiruchirapalli, Tamil Nadu, to Shri Thethakudi Harihara Sarma and Smt. Neelambal. His father, a well-known percussionist himself, was his first guru. After learning from his father for one year, he gave his first public performance at the tender age of 13 in Shri Dakshinamurthy temple, Chennai. His reputation increased when he accompanied the likes of Shri Ariaykudi Ramanuja Iyengar, Shri Semmangudi Srinivase Iyer, Flut Mali Dr. Balamuralikrishna, and Shri Chembai Vaidhyanadha Bhagavathar. He also played with great percussionists like Shri Palakkad Mani Iyer and Shri Palani Subramaniya Pillai. In the cine field he has played for Shri M.K. Thyagaraja Bhagavather and Shri T.R. Mahalingam. He has also worked with legendary music directors like G. Ramanathan, C.N. Pandurangan, K.V. Mahdevan, M.S. Viswanathan, Illayarajaand A.R. Rahman. Shri Vinayakram's first overseas performance was in 1966 when he accompanied Bharat Ratna Smt. M.S. subbulakshmi in the unforgettable concert at the United Nations Organization in New York. Since then he has toured widely across Europe, America, the Middle East and Asia. He has also undertaken a musical tour under the auspices of the Indian Council for Cultural Relations (ICCR) and the Sangeeth Natak Academy. In 1974, he was invited as a gust lecturer to teach music at the Centre for World Music in Berkeley California. In the 1970s, he joined Shakti, a group which combined elements of traditional Indian music with jazz. The band consisted of English guitarist John McLaughlin, Zakir Hussain (tabla), and L.Shankar (violin). It merged Indian music with western music and entralled music lovers everywhere. He also represented Indian in Planet Drum, an album created by Mickey Hart to show rhythm from a variety of musical genres. Shri Vinaykram is serving as the pricipal of a percussion school, Shri Jaya Ganesh Tala Vadhya Vidhyalaya, Triplicane, Chennai. It was founde by his father Shri Harihara Sarma. This school teaches percussion free to enthusiasts and under-privileged students. Many accomplished artists like Karaikudi Mani and Ghatam Sukanya Ramgopal have attended this school. Shri Vianyakram himself was a student. Spanning six decades of service to Indian music, Shri Vinayakram is the only musician to have received awardsfrom four different Presidents of India - Dr. Rajendra Prasad, Hon. R. Venkatraman, Hon K.R. Narayanan, and Hon. Pranab Mukherjee. The Sangeetha Natak Academy conferred a fellowship award on him and he was awarded the prestigious Padmashree in 2002. He is the recipient of many awards and titles, some of which are the Ghatam Nada Mani award from the Kanchi Samigal Kalamamani by the government of Tamil Nadu, a Grammy Award from the USA (the first and only winner for South Indian classical music) the Sangeetha Natak Academy Award recognizing Ghatam, the Ustad Amjad Ali Khan award and the Tala Ratna award by Zakir Hussain. Samir Chatterjee is a virtuoso Tabla player from India. He travels widely across the world throughout the year performing in numerous festivals as a soloist or with other outstanding musicians from both Indian and non-Indian musical traditions. Samir performed at the Nobel Peace Prize ceremony in Oslo, Norway in 2007. He also performed a few times at the United Nations General Assembly. His compositions are widely acclaimed as well as his writings. Samir is a firm believer in the transforming effect of music on the society and all aspects of his work reflects this conviction. Chatterjee began his studies early with Pt. Bankim Ghosh, Pt. Balaram Mukherjee, Pt. Rathin Dhar and Mohammad Salim. His later formation as a musician occurred under the guidance of Pt. Amalesh Chatterjee (since 1966) and Pt. Shyamal Bose (since 1984). All of Samir's teachers have been from the Farrukhabad Gharana (school) of Tabla-playing, which he now represents. Samir is rated ‘A’ as an artiste of Indian national radio and television of India. He can be heard on numerous recordings featuring as soloist, accompanying many of India's greatest musicians and in collaboration with western musicians of outstanding caliber. In concert Samir has accompanied many of India's greatest musicians including Ravi Shankar, Ud. Vilayat Khan, Pt. Bhimsen Joshi, Pt. Jasraj, Pt. Nikhil Banerjee, Pt. V.G. Jog, Pt . Shivkumar Sharma, Pt. Hariprasad Chaurasia, M. S. Gopalakrishnan, Ud. Amjad Ali Khan, Ud. Salamat Ali Khan, Smt. Lakshmi Shankar, Ud. Aashis Khan, Dr. L. Subramanium, Ud. Nasiruddin Saami, Ud. Shujat Khan, Pt. Ajoy Chakraborty, Ud. Nishat Khan, Pt. Ulhas Kashalkar, Pta. Veena Sahashrabuddhe, Ud. Rashid Khan, Pt. Tejendra N. Mazumdar, Pt. Debashish Bhattacharya, to name only a few. Samir Chatterjee lives in the New York-New Jersey area, and has been a catalyst in the fusion of Indian and Non-Indian music, in his own creations and others as well. He performs with Pauline Oliveros, William Parker, Branford Marsalis, Ravi Coltrane, Joshua Bell, Dave Douglas, Steve Gorn, Glen Velez, Boby Sanabria, Ben Verdery, Dance Theater of Harlem, Boston Philharmonic, Minnesota Orchestra, Ethos Percussion group, Da Capo Chamber Orchestra, Boston Musica Viva and other jazz, classical and avant guard musicians and ensembles. He is member of jazz trio SYNC with Ned Rothenberg. He also collaborates with Sufi-Rock singer Salman Ahmad of Junoon from Pakistan. He is the composer and director of Indo-Flame – a blend of Indian and Flamenco dance and music, Chhand-Anand - a world percussion ensemble, RabiThakur – a ballet on the life of Tagore, Meghadootam – a feature program of music and dance on an ancient Indian poem, and Dawn to Dusk and Beyond – on the effect of music on humans and nature. He performs with Sanjay Mishra on his CD "Blue Incantation" featuring Jerry Garcia as guest artist. Samir Chatterjee has been teaching for four decades and many of his students are established performers. He is the Founding President Chhandayan, an organization dedicated to promoting and preserving Indian music and culture. He has authored a comprehensive 654-page book entitled ‘A Study of Tabla’, a guidebook to Indian music titled ‘Music of India’ and ‘Those Forty Days’, a journal of an austere practice regimen he undertook during the summer of 2016. He is on the faculty at the Manhattan School of Music, University of Pittsburgh and New School for Jazz and Contemporary Music. He won gold medal for his proficiency in a musical examination and has two master degrees, in English and History. Since June, 2008 Samir has been working relentlessly towards the musical revival of Afghanistan. He has made several trips to the country working with different levels of the society and administration and within a very short period of time he has been able to make a remarkable difference in the cultural life of the country. He is the recipient of several awards such as the Sunshine Award, Jadu Bhatta Award and Acharya Varistha Award. Selvaganesh’s tryst with the international music platform came in the early 90s in Masters of Percussion along with his Zakir’s father Ustad Alla Rakha and late 90's when he joined Shakti to play along with John McLaughlin and Zakir Hussain. The showman that he is, his long hair and nimble fingers had Shakti catapult to fame. Apart from playing authentic Carnatic Music, he has performed in many Fusion, Jazz, Blues, Flamenco, Symphony Orchestra, Celtic Music, Latin Music, DJ Music, World Music, Talavadya (Percussion Ensemble) and Jugalbandhi concerts and has been part of numerous International Music Festivals with renowned Indian Musicians like Dr L Shankar, Dr.L.Subramaniam, Pandit Jasraj, Pandit Shivkumar Sharma, Pandit Hariprasad Chaurasia, He has also worked with many leading music directors in India. He was a child prodigy, with his concert career beginning at the age of 10. He established his right to be on the stage by playing with such dexterity that he was soon accompanying many famous vocalists in Carnatic music at the time, including Mangalampalli Balamuralikrishna, , M. S. Subbulakshmi and others. Selvaganesh gained world fame through tours with John McLaughlin's group Remember Shakti. He helps his father, Grammy-winner T.H. "Vikku" Vinayakram, to run the Sri JGTV school and train a new generation of percussionists. He has also composed and produced albums, and played with the Swedish bass virtuoso Jonas Hellborg and American guitar player Shawn Lane. His debut international solo album, Soukha was released in 2006 featuring all other regular members of Remember Shakti including John McLaughlin, Zakir Hussain, U. Srinivas and Shankar Mahadevan, as well as sitar player Niladri Kumar and Selvaganesh's father T.H. "Vikku" Vinayakram. He has also formed a new group called dr JSM, with the UK-based Goan songwriter/producer dr.Joel and the young Carnatic singer Mahesh. Their Indo-Celtic album entitled Turn on the dreams was released in the UK in 2005. He performed in the Prestigious United Nations day in New York in 2009. It is somehow fitting that the oldest instrument in the band is responsible for creating an almost techno vibe; the constant bell-like jangle of the kanjeera brings to mind the warp-speed jungle-groove of drum-and-bass music. His latest venture is in the field of Indian Film Music. His debut music for a regional language film “Vennila Kabadi Kuzhu” is already a super hit. He has composed for a few more and had got a name for himself. Adding feather to the cap is his Filmi work in the Telugu Movie industry as well, wherein his first movie was a musical hit and is in the process of composing a few more. Swaminathan is the grandson of Padhmasri T. H. Vinayakram and son of V.Selvaganesh. He was born on 25th april 1993. 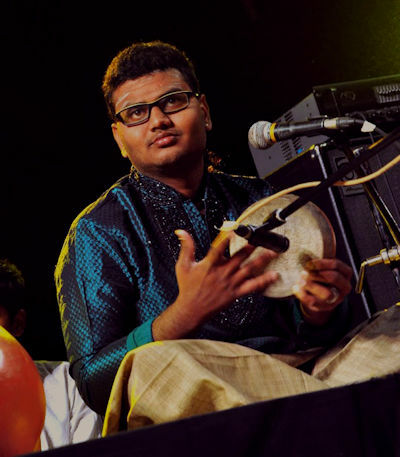 Being born in a family devoted to traditional music, Swaminathan started learning kanjeera when he was 4 years old under the guidance of his grandfather and father. He gave his first performance in a concert at the age of 12 accompanying his grandfather . He started his carrier with Iissai Mazhalai an initiative by Abhaswaram RAMJI, who gave opportunities for young talents to showcase their expertise . He takes pride in playing alongside his grandfather Vikku ji for several concerts across the globe. He feels blessed to explore and experience rhythm with his guru, mentor and role model Vikku ji who introduced him into world fusion group MYNTA. His father Shri V. Selvaganesh and Swaminathan started doing duo concerts and the very first performance with both of them together was held at Goa festival of music in KALA ACADEMY which was followed by several musical tours in India. Along with his musical friends and his uncle V. Umashankar, he played during the Chennai Super Kings’ match held at Chennai. And he also performed in zee TV’s Saregamapa and many television shows. Swaminathan had a opportunity to share stage with legends like Pandit Hariprasad Chaurasia, Balamurali Krishna, Ustad Zakir Hussain and many leading artists. Vikku ji started the group named 3G with V. Selvaganesh and S. Swaminathan, where three generations (grandfather, father and son) playing together in stage. 3G gave its first performance at Idea Jalsa an initiative by Durga Jasraj and followed by various successful performances. A Ganesan, disciple of T R Harihara Sharma, and Maestro Padmashri.Shri.Vikku Vinayakram, and also Shri T H Subashchandran. Having started his career at the age of 8 years and has been playing the Morsing for several leading musicians such as Dr.M.Balamurali Krishna, Shri.T.N.Krishnan, Shri Mandolin Shrinivas, along with Ustad Zakir Hussain Shri.Ganesh & shri.Kumaresh, Shri.N.Ramani and many other eminent artiste. He is an accompanied senior artist, and has played along with great stalwarts in the music field. He is also a senior instructor in Jay Ganesh Tala Vadya Vidyala, the school of Rhythm being manged by Padmabushan Awardee Shri Vikku Vinayakram. He has performed tala vadya kutcheries with Shri.Vikku vinayakram, Shri.Bhavani Shankar, Shri.Selvaganesh and others. He is also member of “Sapthaakshara” a renowned group by Shri.Vikku Vinayakram. A Ganesan has traveled widely and performed in various prestigious halls such as Queen Elizabeth, The royal Festival Hall in London, the Lincoln Centre in New York and has participated various Indian musical festivals in abroad. He has been awarded by Unesco for participating in the millennium festival in bali. Received “Kanchi Kamakoti Asthana Vidwan” from Kanchi Mutt in 2011. This performance is part of the 2017 All Night Concert. Follow this link for tickets and more information. Chhandayan is Tax Exempt under section 501(c)(3) of the IRS as a non-profit organization. Copyright © 1995-2017. All Rights Reserved.